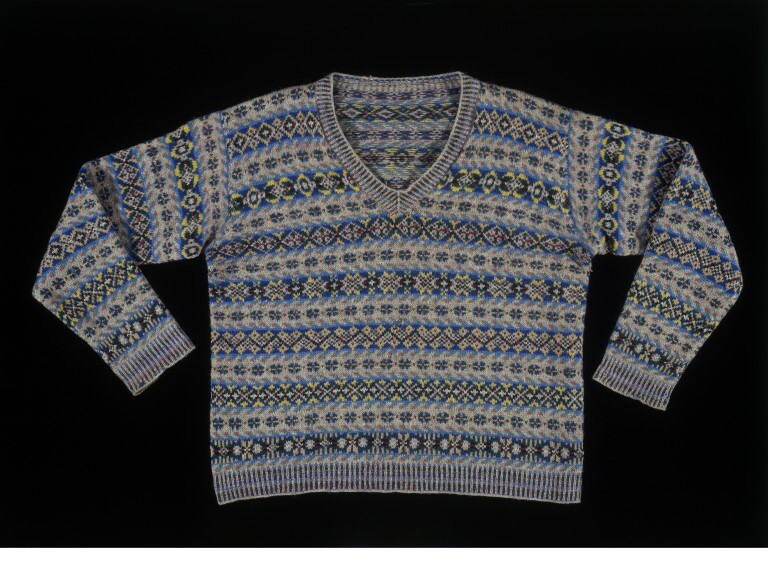 This V-necked sweater follows the fashion created by the Prince of Wales in the 1920s. 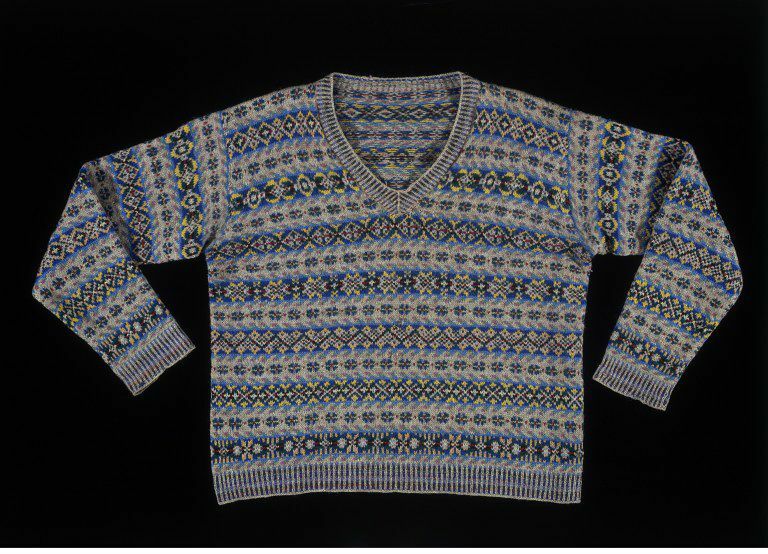 He started a craze for knitted jumpers by wearing a Fair Isle sweater to play golf at St Andrews in Scotland. This sweater is hand-knitted in stocking stitch with fine two-ply wool. The garment is knitted in the round, without seams, up to the armholes and the arms are grafted on. The grey ground is decorated with a Fair Isle pattern in blue, yellow, red, green, brown and black. However, in traditional knitting of this kind, the knitters use no more than two colours in one row. They use a plain stitch for the ground and a purl stitch for the coloured wools. This gives the overall striped effect to the ribbing that is typical of Shetland and Fair Isle knitting. V-necked jumper hand-knitted in stocking stitch with two-ply wool. The grey ground is decorated with bands of traditional Fair Isle pattern in yellow and blue with smaller areas of green, red, brown and black. Long sleeves. The ribbing at the neck, cuffs and bottom edges is a one and one rib. The plain stitches are all in grey wool and the pearl stitches are in the coloured wools for the striped effect. Seamless as it is knitted in the round and grafted at the shoulders, the sleeves are worked from stitches picked up around the armholes. The depth of the ribbing at the bottom edge and cuffs is approximately 1.5 inches and 1 inch at the neck. 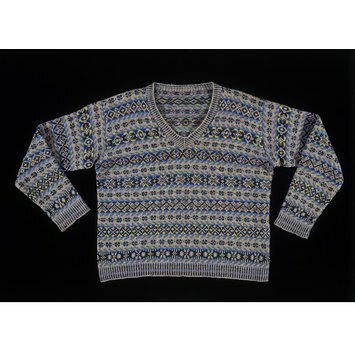 This jersey is in the traditional technique of circular knitting without seams, the shoulders are grafted. It is thought to have come from Tulloch Knitwear, Lerwick, who supplied 'Fair Isles' to such fashionable shops as Liberty's in London.